The classic KULT campaign, spanning six chapters, available for the first time ever in English! Adapted for KULT: DIVINITY LOST. When the new year’s eve of 1941 shifts to 1942, all the candles extinguish in the churches of Leningrad. The Saint’s faces turn to black. The fabric of reality tears. When morning comes, twenty priests are found dead by their own hands. A silent girl with many secrets is found in a closed off basement. No one knows who she is or where she lives. With no other options available, she is taken to an orphanage where nothing is as it seems. The same cold winter night, Dimi, an old icon painter, meets a strange woman on his way home. She reveals her face to him and gives him a command, then walks away. Back in his small apartment, he immediately starts painting a new icon. An icon depicting a Black Madonna. 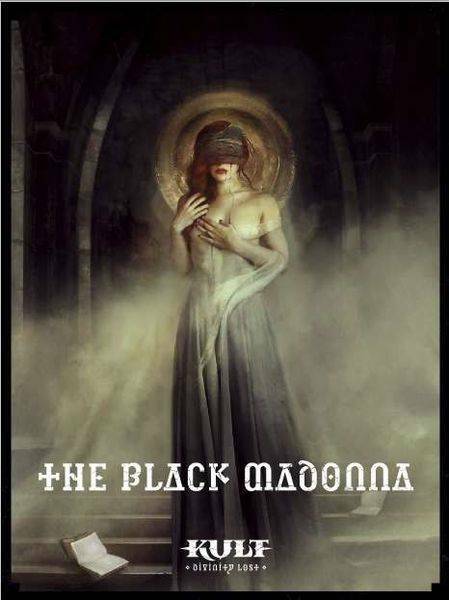 The Black Madonna is a legendary KULT campaign previously unreleased outside of Sweden and France. Its six separate episodes lead the player characters into a haunting adventure connected to the Death Angel Chagidiel and the Archon Binah, and their servants. Taking place in 1991 and set in a recently reunified Germany, the journey will lead the player characters into a Soviet Union on the brink of collapse, to unlock the mystery of what actually happened in Leningrad during World War 2. During the campaign, they will be taken to a world of dark dreams, and venture into the depths of Inferno, trying to save themselves.